An endless stream of car headlights glow during the evening hours along Cote de la Montagne in Old Quebec City in Quebec, Canada. 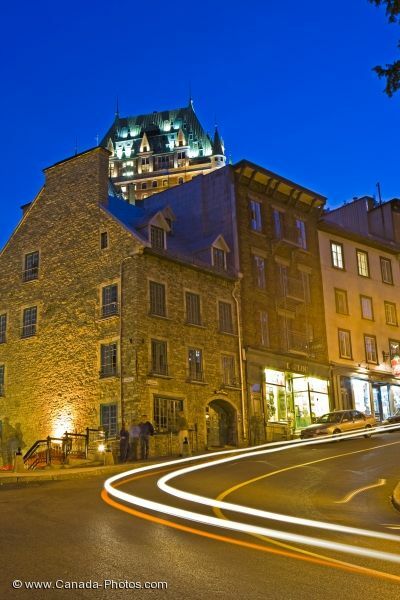 Shops line the sidewalks before the bend in the street as the green coloring on the rooftop of the Fairmont Le Chateau Frontenac towers over the other historic buildings. Fairmont Le Chateau Frontenac seen at blue hour from along Cote de la Montagne in Old Quebec, Quebec City, Quebec, Canada. UNESCO World Heritage Site. Picture of the car headlights around the bend in the street in Old Quebec, Quebec in Canada.